Here are 21 of our favorite events happening in Los Angeles this week. We’ll be back on Thursday with our Weekend Planner column to help you plan—what else?— the weekend ahead. And don’t forget to check out the June Guide for other ideas. FESTIVAL: This week the Pow! Wow! Long Beach festival takes over Long Beach from Monday through June 28. The public arts festival, which originated in the Kaka’ako district of Honolulu, brings more than 100 international and local artists together to create murals and other forms of art within the community. “Pow! Wow! aims to beautify and enhance local neighborhoods through its global networks of artists drawing gallery shows, lectures, concerts and live art installations to the festival.” On Monday, there’s a special edition of Dinner & a Mixtape masterminded by DJ Neil Armstrong. CRUSTACEANS: KNUCKLES.CLAWS.TAIL is Patina Restaurant Group’s food series in which the restaurant group’s (Café Pinot, Ray’s & Stark Bar, Tangata, and Leatherby’s Café Rouge) chefs pair lobster dishes with rosé pairings beginning on Monday. Menu items include lobster rolls, lobster pot pie and more. Rosé carafes for one ($16) or two ($38) available at all locations. BEER + DESSERT: Bow & Truss in NoHo partners with Golden Road Brewery for Beer Week from June 22-28, serving flights of beer with a dessert pairing. The pairings are: Berliner Weiss with Raspberry Cilantro Syrup; Wolf Among Weeds with Pineapple Rosemary Cake; Saison Citron with a Saison Marinated Strawberry Tart; Golden Road Red with a Roasted Plum Gallette; and a Get Up Offa That Brown with a Cherry Brownie. PHOTO: The online retailer über EDITIONS sells limited edition fine art prints, but on Monday through Saturday, über EDITIONS hosts a one-week only exhibition and sale of rare archived photos of the Rolling Stones&apos; 1971 club show Live at the Marquee, taken by British rock photographer Alec Byrne. The exhibition takes place at The Perfect Exposure Gallery and there’s an opening night reception on Monday from 7-9 pm. The images’ debut coincides with the release of the Stones’ The Marquee Club - Live in 1971 DVD, which also bows on Monday. FILM: On Tuesday at 7:30 pm, LACMA presents the film The Lives of Hamilton Fish, directed by artist Rachel Mason. The film fantasy is told entirely through songs performed live by Mason herself. It&apos;s based on a real coincidence the artist discovered about two famous men who lived in New York during the Great Depression. On January 16, 1936, the deaths of serial killer and a statesman—both named Hamilton Fish—were printed on the front page of the Peekskill Evening Star News. “The film’s story is sung in the voice of Mason and performed live, as a surreal tale unfolds where supernatural events and historic facts merge in a wild, musical journey.” Free. FILM: Little Annie Motel Productions holds a free public screening of the short film Tabloid Blvd on Tuesday at 8 pm at Ham and Eggs Tavern. The film is the untold story of Hollywood Blvd’s Golden Couple, the Priscilla and Elvis Presley impersonator duo and the tragic, costar affair that tears their world apart. The film will be the centerpiece at the premiere, which also includes Presley Trivia, cake, popcorn and peanut butter and banana sandwiches. MUSIC: The Echo presents Eagle Rock Brewery&apos;s Battle of the Bands on Tuesday beginning at 6 pm at the Echoplex. The event coincides with L.A. Beer Week as a way for some friendly competition between SoCal breweries with bands of at least 75% brewery owners/staff/brewers. So far there are 15 bands on the bill who each have 10 minutes to play. The audience gets to vote for their favorite band by dropping a token into that band&apos;s ballot box. Winner gets bragging rights. Tickets: $10 in advance and $12 at the door. The event is 21+. ART: LAND (Los Angeles Nomadic Division) presents the opening reception for the exhibition of The Manifest Destiny Billboard Project’s Culminating Weekend and Matthew Brannon’s series of billboards, Certain Snakes, which wraps the two-year project. The artist’s billboards “play on the disillusionment of hopes and dreams associated with heading west, particularly to Los Angeles. In reality, the fantasy of this city becomes evermore opaque and intangible.” The opening reception is on Wednesday from 7-9 pm. Other programs this week feature artist programs, readings, screenings, performances, installations, conversations, city explorations and other happenings. FILM: The Last Remaining Seats—the film series screens classic films in historic theaters—continues on Wednesday night with a screening of Willy Wonka and the Chocolate Factory (1971) at the Orpheum Theatre. Special guests are Madeline Stuart and Peter Stuart, children of the film&apos;s director, Mel Stuart, in conversation with KPCC host John Rabe. The Stuarts will talk about the making of the film and their time on set with their father. All movie goers will receive a $10 Candy Card on the night of the show, courtesy of local candy boutique Sugarfina. Tickets: $20 general public (no limit); $16 Conservancy members (limit 4). MUSIC: Red Bull Sound Select series continues on Wednesday at 8 pm with music at the Echo featuring headliner Bilal and rising local artists Thurz and Oddience. The series helps highlight local bands and connect them directly to the public. The show is 21+ and tickets are $3 for those who RSVP by 6 pm on the day of the show (up to capacity), and $12 at the door without an RSVP, with all proceeds going back to support the opening local band. COMEDY: Idiots is a relatively new weekly standup show at The Clubhouse in Los Feliz. Hosted by Dan Gill, David Venhuizen and Colin McCormick, this Wednesday night’s show features Eddie Pepitone, Kyle Kinane, Eliza Skinner, Matt Ingebretson and Pat Regan. The show begins at 8 pm, and there’s free beer, too. An open mic hosted by Gill and Venhuizen from 7-8. FILM: Magnolia Pictures, Sundance NEXT FEST, Outfest and Ace Hotel in DTLA s present a special advance screening of Tangerine on Wednesday at 7:30 pm at the Theater at Ace Hotel. In the film, a working girl and her best friend track down her pimp boyfriend to find out if he really cheated while she was locked up. The film traverses various subcultures of L.A. Special DJ set by Little Boots to immediately follow the screening. Tickets: $15, $25 (orchestra seating and after-party included). Limited Runs presents an exhibition that features jazz portraits from Metronome Magazine. (Image: Courtesy of LimitedRuns.com). PHOTOGRAPHY: The online seller LimitedRuns.com is hosting a national traveling exhibition and sale that debuts in L.A. on Wednesday that features images of several jazz greats that debuted in Metronome Magazine. ​The magazine was first published in 1881 and quickly became the premiere music magazine of its time. 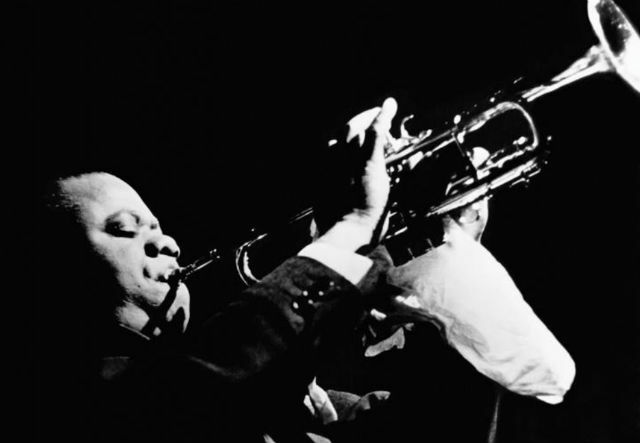 The exhibition features prints of many of the pioneers of American Jazz music, including Louis Armstrong, Duke Ellington, Count Basie, Miles Davis, Billie Holiday, Benny Goodman, Ella Fitzgerald, Dave Brubeck, Thelonious Monk, John Coltrane and many more. The show runs through Saturday, June 27 at Strauss Studios (6442 Santa Monica Blvd.). The opening night premiere runs from 6-9 pm and you must RSVP to support@limitedruns.com for the event. FILM: On Wednesday night, American Cinematheque continues its series Young French Cinema with a double feature of Macaroni and Cheese (2012), a comedy directed by Sophie Letourneur that was mostly shot guerrilla-style at the 2011 Locarno Film Festival in Switzerland. It’s followed by Party Girl (2014), directed by Marie Amachoukeli, Claire Burger and Samuel Theis. The double feature begins at 7:30 pm, but get to the Egyptian at 6:45 pm for “l’Apero” (drinks and appetizers), sponsored by Normandie Bakery and Wine-Street.com. Director Letourneur does a Q&A between films. FOOD + COCKTAILS: The Ceviche Project and DeLeón Tequila take over the Skybar at Mondrian for a five-part dinner series that features a five-course seafood pop-up dinner and handcrafted cocktail pairings, beginning on Thursday. The menu includes ceviche variations, tiraditos, oysters on the half-shell and crudo preparations. A DeLeón Tequila tasting precedes dinner, in which five dishes are paired with different DeLeón cocktails. Other dates in the series are: July 23, August 20, September 24 and October 22. Menus vary each night. Tickets: $125. STORYTELLING: The RISK! Storytelling show is at NerdMelt on Thursday at 9 pm with people telling true stories they’d never thought they’d share in public. Hosted by Beowulf Jones and Kiran Deol, the evening’s theme is Rejoicing with stories provided by Samm Levine, Al Jackson, Drew Droege and Jimmy O. Yang. Tickets: $8 in advance, $10 at the door. YOGA + DANCE: Daybreaker brings is early morning yoga-dance party to downtown LA on Thursday morning. The yoga runs from 5:30-6:15 am. And the dance party runs from 6:30-8:30 am at The Unique Space. DJ David Hohme brings the beats, and there will be coffee, juice and breakfast treats. Tickets: $20-$35. FILM: The Shout Factory releases the highly anticipated release of Penelope Spheeris’ The Decline Of Western Civilization Collection on June 30. To celebrate the release and LA’s 80s punk subculture, there’s a series of theatrical screenings including Decline Part I on June 25 at the Arclight Hollywood. Spheeris herself will be in attendance to do a Q&A after the 7:30 pm screening. Tickets: $16. COMEDY: Highly Recommended, an evening of comedy is at Ye Olde King&apos;s Head in Santa Monica on Thursday from 8:45-10 pm. Hosted by Kyle Martin, the bill featured comedy by Michael Kosta , Melissa Villasenor, Eddie Della Siepe and a special surprise guest. Tickets: $8. Related: June Events Guide: 20 of Our Favorite Events in L.A.